Over time, the property lines of a property might become less clear, particularly when the property has changed hands many times, when the landscape has been altered or when new structures are built. Determining exactly where your property ends can be difficult if the land hasn’t been surveyed in years, but once you know where the lines are, you can makes sure you don’t lose track of them again. Examine your land plat. A plat is a map that shows the actually features of the land along with the placement of the house and any other structures. Upon purchasing your property a plat may have been provided. On the plat you should see the placement of the survey stakes. Try to locate the survey stakes that were originally placed at the corners of your property. Survey stakes are typically metal or steel stakes or pipes that licensed surveyors place in the ground. When initially placed, the top of the stake is flush with ground level, but over time the stake might have been covered with soil and thus could be several inches below the surface. (A metal detector might help you locate your stakes, but beware, that loud beeping may simply mean you’ve found an old bottle cap) Finding the survey stakes, that were placed by state-licensed land surveyors, is justifiable evidence to determine property lines. However, if there is a dispute over the property lines, another licensed surveyor might need to be hired. The city of Minneapolis estimates the cost of hiring a land surveyor to be between $700 and $900 in 2010, but points out that removing or relocating structures after a survey can be much more expensive. Thus, they advise, before building near property lines, you should first confirm their location. Hire a surveyor. If you can’t find your survey stakes or if you disagree with the placement of the stakes and suspect the marking is inaccurate, hire a state-licensed surveyor. Plant natural property markers or erect a fence. Property lines can be permanently defined if you plant a line of brush or build a fence between the survey stakes. Michigan Bulb Company recommends a privet hedge, a “wall of China” hedge or a dwarf burning bush hedge for a natural fence. Keep in mind, however, that if you do opt for a natural fence you’ll need to maintain it by pruning to keep the fence within the height limits of city regulations. If you’d prefer to erect a fence rather than grow one, you can choose chain link, a wooden privacy fence, or a pretty white picket fence, to name just a few. 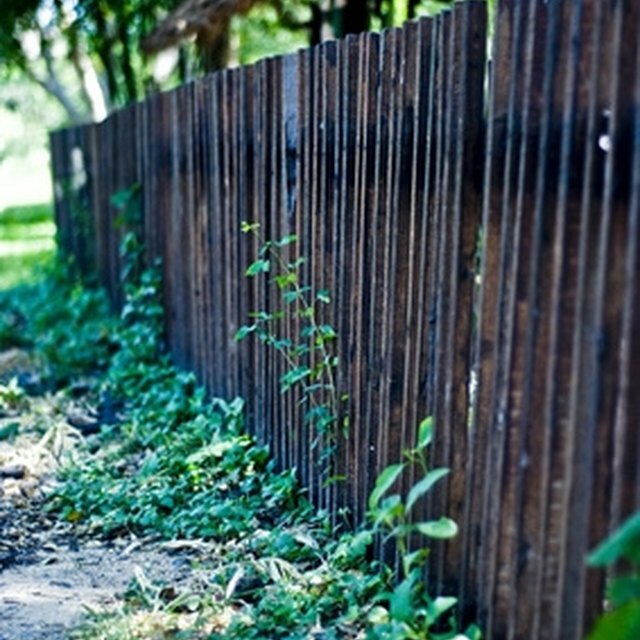 With your fence erected or grown, you'll never forget where your land ends again. What to Do About Your Neighbor's Ivy & Berry Bushes Knocking Down Your Fence & Growing in Your Yard?